Select wood decorative traverse rod with 2 1/4" wood facial over select supreme traverse rod. Ten colors to select from plus unfinished. Finials optional, search select wood. Base Price is for unfinished rods. Colors will show price in the cart. Price includes 3.5 carriers per foot and standard wall brackets that have 3" to 4" returns. Note: Rods over 100" have to be shipped by truck..
Use with many types of curtains. Black finish, projects 3 1/2 to 4 1/2 inches, clearance 2 1/2 to 3 1/2 inches, includes mounting hardware. 1 1/2 inch Windsor curtain rod. drapery hardware collection by Graber Rods are metal, slides and finials are plastic. Graber Decorative traverse rod set 28-48" projects 3 1/2" to 4 1/2"
Graber drapery rods, bright brass finish, includes mounting hardware. Clearance 2 1/2 to 3 1/2". Adjustable end brackets are hidden style . Rods are metal, slides and finials are plastic. A projection extender is available to add 2" to the rod projection. 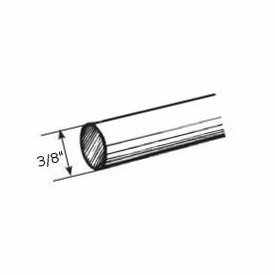 1-423-8: Graber Decorative traverse rods 66-120" two-way draw 1 1/2"
Kirsch and Graber Tension Curtain rods from eight inches to seventy-two inches for areas where you do not want to drill holes in the wall. Some examples that are suited for the spring tension curtain rods are door sidelight windows and windows with framing that allow for inside mounting. Great for home and apartment renters with restrictions that do not allow drilling. Metropolitan modern curtain rod double bracket. Use with tab top curtains, eyelet curtains or pinch pleat draperies. Metropolitan modern curtain rod finial. Use with tab top curtains, eyelet curtains or pinch pleat draperies. Crystal look with base finished in Brushed Nickel or black. The Metropolitan Collection gives you the opportunity to dress your window draperies with an elegant modern look and feel. This 1 1/8 inch curtain rod comes in brushed nickel and just added, black, finishes. Crafted using a combination of steel, zinc-alloy and acrylic materials to give you a sleek,contemporary look. A wide selection selection of finials, brackets and components allow you to cumtomize your windows with a quality, well priced product delivered in a short time frame. Shipping time is only one to two business days on the entire line.